If you’re anything like me, cleaning out your closets gives you a real feeling of satisfaction. It’s a way to bring order to your life, find possessions that you might have forgotten about, and most importantly, further reassure yourself there are no monsters living inside. But this blog isn’t about your closet. 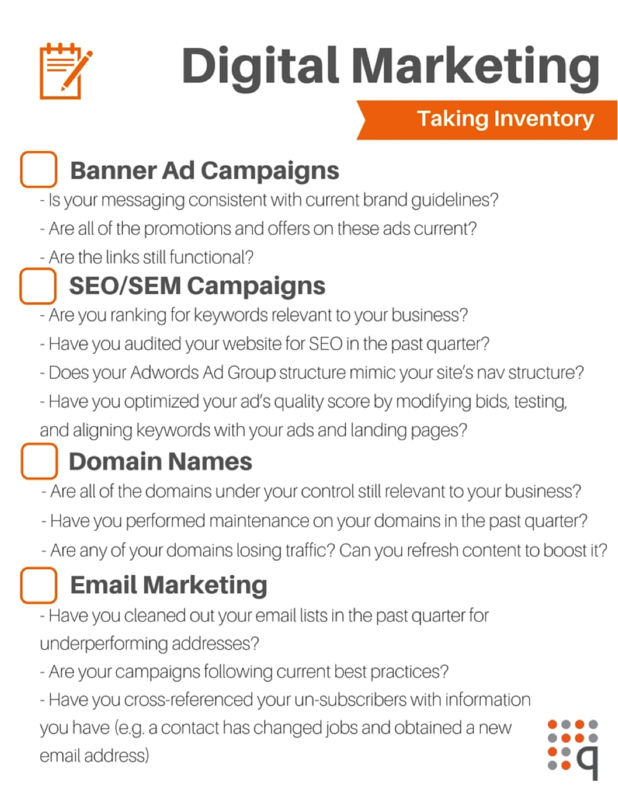 It’s about “cleaning out” and taking inventory of your company’s marketing program. The same principles apply here, but there’s much more at stake (and it’s a tad more complicated, too). Whether annually, bi-annually, or within some other predetermined timeframe, taking inventory of your marketing efforts at regular intervals ensures you’re reaching the right customer with the right information, as well as shaving off any inefficiencies that exist in your marketing programs. Where to start? Step outside your marketing comfort zone, and use these checklists to cover all your bases (we even made them printable – enjoy!). Is your messaging consistent with current brand guidelines? Are all of the promotions and offers on these ads current? Are the links still functional? Which keywords are you ranking for? Are they relevant to your business goals? Have you audited your website for SEO in the past quarter? Does your Adwords Ad Group structure mimic your site’s navigational structure? Have you optimized your ad’s quality score by modifying bids, testing, and aligning keywords with your ads and landing pages? Are all of the domains under your control still relevant to your business goals? Have you performed routine maintenance on all relevant domains in the past three months? Are any of your domains losing traffic? Can you refresh content to boost it? Have you cleaned out your email lists in the past quarter for underperforming addresses? Are your campaigns following current best practices? Have you cross-referenced your unsubscribers with information you have (e.g. a contact has changed jobs and obtained a new email address)? Is your company contact information displayed correctly? Have you performed a social media audit in the past quarter? Have you refreshed cover photos and other pertinent imagery in the past three months? Is your company maintaining a presence on the most appropriate channels for your brand? Are you responding to your customers on each social media channel? Do you have content that speaks to each of your buyer personas? Is your blog’s imagery consistent and reflective of your current brand guidelines? Do you have a backlink strategy? How is it performing? 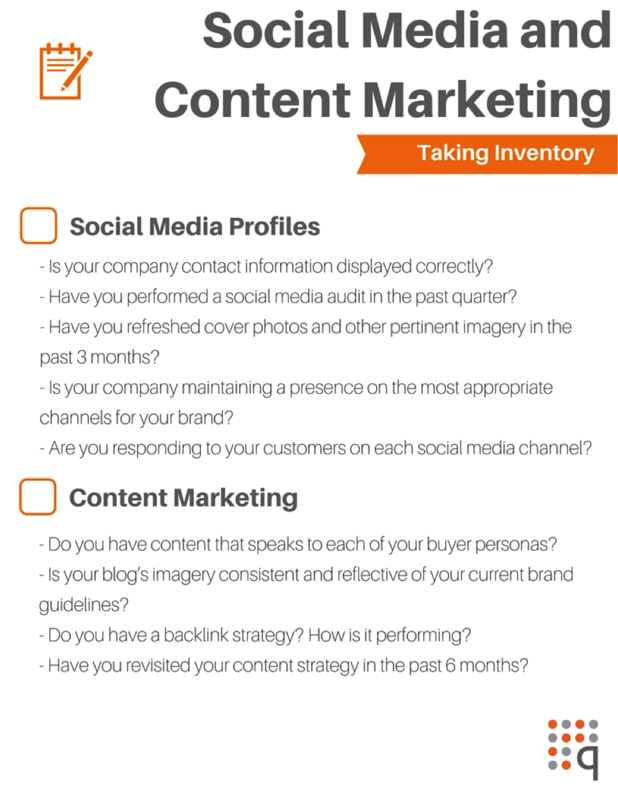 Have you revisited your content strategy in the past six months? How many printed publications do you currently disseminate? Is all company information up to date and printed correctly? Are you using up-to-date research to inform your content? Have you sent out a consumer survey in the past 6 months? Have you measured the publication’s ROI? How is it performing? How many direct mail campaigns are you currently running? Is your direct mail generating the amount of leads you projected? Are you working with the most cost-effective vendor to print your kits? 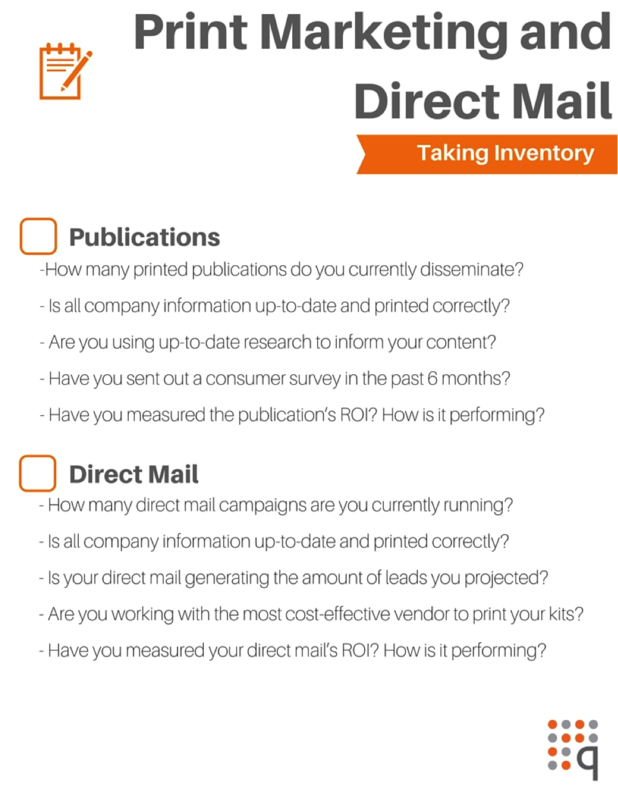 Have you measured your direct mail’s ROI? How is it performing? Click here to get all of the checklists you need. But, if this all feels like a big undertaking, you’re not crazy. It may be time to supplement your lean marketing team with an agency’s support. We might be able to help. Get in touch with us at info@quattrodirect.com with any and all of your marketing challenges.